Zainetica's 3rd solo outing on Boltfish Recordings. "We know little of Mark Streatfield apart from the fact that he has put out a couple of releases for small underground labels like clickclickdrone and Boltfish, on which he offers his third ep featuring 5 tracks. Organic sounds, diluted in a sea of persuasive circling rhythms. Electro ambience dipped in gallons of melancholy. This, in essence is the young Englishman's formula. And exactly that sound, Zainetica's type of programmed manifesto, rises from the opening track on the EP." "Released a month ago on British label Boltfish, "When the time comes" is the eighth EP from this very productive Englishman, to say the least - a man with no less than eight EPs and four LPs to his credit, without counting the many tracks and remixes on various compilations, and all that since 2003! It's a wonder that he's human. We already know that it lives in London, is a designer, makes electronica, that he buys too many CDs, that he is with the head of Rednetic Records, that he has visited Australia and France, that he doesn't like politicians or television but does like football, is bad at maths and likes to make lists... but you can also be sure he's a true genius, musically speaking. While all his releases deserve an ear (or two, even), this one constitutes a good introduction for the newcomer to his music, especially as this is a free downloadable release, so you have no excuse. Five excellent tracks, five different environments. "Names from my shadow" and "Shattered bones" come close to the electronica/noise style of most tracks on the LP "I fall apart" left on IVDT, whilst "Ruined" and "Eleven six four two", offer melodies like those in the EPs "Summer rain" and "Calm mountain". The title track is a small mixture of all that." "From the very beginning ' When the time comes ' has you drawn in, with almost ghostly murmurings..."
"This ep is like another glowing page in the ever increasingly impressive Zainetica manual, its stuffed with melodies and security passes to secret doors into to areas of your mind that forget that you have to go to work tomorrow, whist being daubed with thick pulsating storylines from the day after the middle of next week, which cannot help to keep you in check. Awesomeness on a small silicon plate! "Zainetica does it again! "When the Time Comes" is the forthcoming EP to be released on Boltfish (Oct 2005) and the five-track EP is an all-out enjoyable electronic affair. 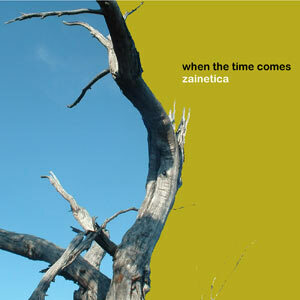 Zainetica continues to churn out tracks with a fierce pace and outstanding quality. The title track "When the Time Comes" floats in the lower realms of the tempo spectrum. "Ruined" got great melody, stringed instrumentation and solid understated bassline. "Names From My Shadow" in its turn features some cleaver engineering based on reversed sound and yes it's quite freighting. "Shattered Bones" is a juggernaut with dry beats pounding away and menacing bassline. Watch does speakers as you press repeat! Ending the EP is "Eleven Six Four Two" is set I hip-hop beat mode and ends the EP. The beats and bass, the gentle guitar lick creates a very strong track indeed and together with "Shattered Bones" it's a clear favourite. The short story: "When the Time Comes" is melancholy stricken and brilliant." "Opening with the title track you're instantly washed over with drifting ambience and electronic rhythms, like listening to a huge super computer try and work out a problem with musical results. The clicks and tones forming sound shapes and mysterious patterns in the ears of those that care to listen. With five tracks to enjoy on this release you'll be spoilt for choice, but 'Shattered Bones' caught my imagination with its swirling moods and moon like vibes. Eerie and cold, whilst being warm and inviting."